It’s been a while since I wrote about Early Take Off. Like lots of projects it is often difficult to maintain momentum when the goals are grand and the steps to reach that goal are small and mostly informative in nature. Some time ago I wrote a Q. and A. about Early Take Off based on questions which I have been asked over the years, I am just getting around to publishing it. You can read it here and it will have a special page of it’s own here on my site. Linda Mecklenburg has written more on the subject and I hope to help keep that momentum going with this article. Read Linda’s new pages on ETS on her website http://www.awesomepaws.us/. I hope you will share it with others, and keep the information and dialogue open about this frustrating syndrome. All the best to you and yours, and sincere hopes for a fab 2012! Q: Why do dogs drop their head and add the little steps before they take off for a jump? NJG: That is sometimes referred to as stutter stepping or measuring. Many, but not all ETS dogs add a small step and drop their head just before they take off early for the jump. Some dogs only do this on spreads or on jumps that are at least 20 feet apart and on a straight approach. Some dogs just take off early without the head drop. It is one of the known symptoms of ETS, and we do not know for sure why some dogs do or don’t do this. As the dog drops his head he might be trying to locate the jump by moving his head up and down. Not all dogs that add steps and drop their head have ETS. At times an injury or body discomfort can cause a dog to add steps before they jump. Dogs that are uncomfortable jumping do not usually stutter step as well as take off early, they might even take off quite close to the jump. Q: Why do some dogs jump short distances just fine but take off early for a jump once the distance between jumps gets to around 20 feet or more? NJG: Since dogs cannot tell us what they see we can only speculate that since ETS dogs have greater difficulty jumping the longer distances, that they have more problems seeing or perceiving where the jump is when it is at a distance greater than around 15 feet. Q: When *should* a dog take off for a jump? NJG: Each dog has a comfortable takeoff distance for a jump. If the dog takes off 8 feet from a jump, but lands 8 feet from the jump, then that might be considered jumping long, but the jump distance is equal on ascent and descent of the jump and so is not considered “early”. Q: How early is early? NJG: On occasion a dog without ETS takes off at a slightly greater distance than they land on a jump. It could be a sign of beginning stages of ETS or it could be nothing at all. If your dog consistently takes off 7 feet from a jump but lands only 3 or 4 feet past the jump that would be considered early. Q: Is ETS a problem with depth perception, and is there a test for that? NJG: There is no eye test for depth perception in dogs. Our dogs cannot tell us exactly what they see and don’t see, and there is nothing in the dogs’ eye that is able to be measured to test their depth perception. Dogs’ eyes are different from ours and they do not have as good depth perception as people. We don’t know for sure how this affects their jumping. 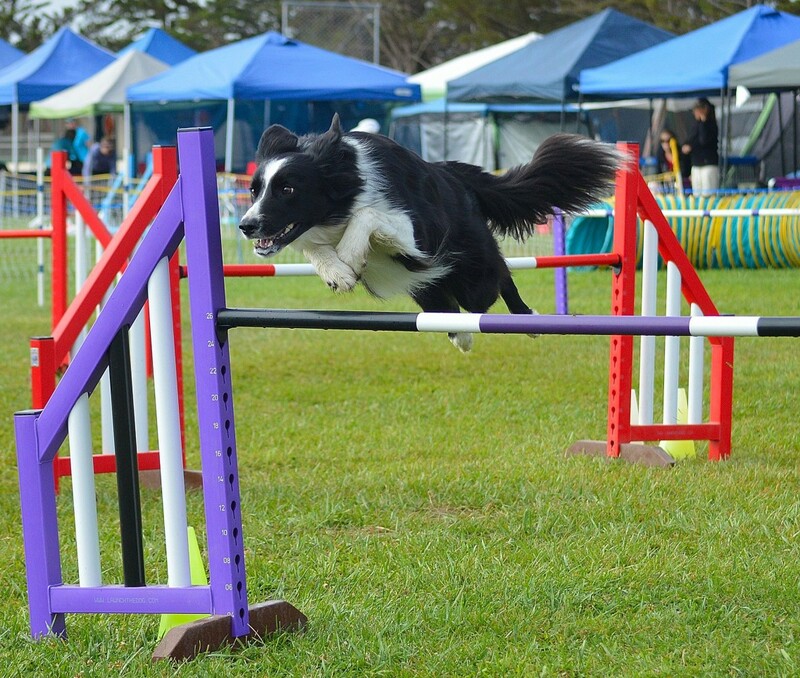 Q: My sheltie usually jumps fine, but sometimes takes off a bit early for a triple, is that ETS? NJG: It could be. Once you have your dog’s vision checked and you have also ruled out any kind of strain or injury that your dog might have, you would then begin to suspect ETS, especially if any of your dogs’ siblings, parents or other relations have ETS. Q: My students’ dog jumps worse in the poorly lighted barn where we train, is that normal? NJG: Some ETS dogs jump worse in poorly lighted buildings or under lights outdoors at night. Some struggle with different footings, like matting or dirt when they usually train on grass. If your dog is already stressing about their jumping it would be normal to expect a dog to struggle even more on different surfaces or in different lighting they are not familiar with. Q: What kind of vision tests should be done on my dog? Are they expensive? NJG: You should have a retinoscopy. In the SF Bay Area the test costs about $200. It could be more or less depending on the Animal Opthamologist you use. Q: What is a retinoscopy, and do they put the dog to sleep to do it? NJG: Your dogs’ eyes are looked at by the veterinarian using a retinoscope and your dog will be awake and usually the owner is with the dog. The entire testing might last an hour. Q: The local animal eye doctor does not do the recommended vision tests, where should I go? NJG: You need to look for a veterinarian who is a Diplomate in Veterinary Opthamology, and that has tested many dogs using Retinoscopy. Some Veterinary Opthamologists have the machine but are not well versed in its’ use. Try doing a google search in your area or call some of the local Veterinary eye clinics for information. The retinoscopy is a test to determine a dog’s acuity. This potentially would determine if the dog is near or far-sighted, or if the difference between the eyes is great enough to warrant a prescription for contacts. Q: My dog’s eyes have been checked and they are totally normal, is that common with ETS dogs? NJG: Yes it is. ETS dogs usually test for being considered to have a normal range of vision. Q: If ETS is a vision problem, why can’t you test a dog’s eyes to diagnose it? NJG: There are many different kinds of diseases in people and animals, and not all of them are able to be diagnosed with specific testing. Some diseases are diagnosed by elimination of other diseases being present which CAN be tested. We are still hoping that advanced research may indeed discover something about our dogs’ eyes that will point to an answer regarding ETS. Q: Why does my ETS dog jump angled jumps and jumps on a circle better than straight on approaches? NJG: The current thinking is that since the jump is on an angle, that your dog has an easier time distinguishing the distance, and height of the jump since you have wings which are offset from each other. This could give your dog more perspective of the jump. There are some writings on dog vision which discuss the difference in how dogs see horizontal lines differently from vertical lines. This might explain why our ETS dogs need the vertical wings to help them analyze where the horizontal jump bar is. 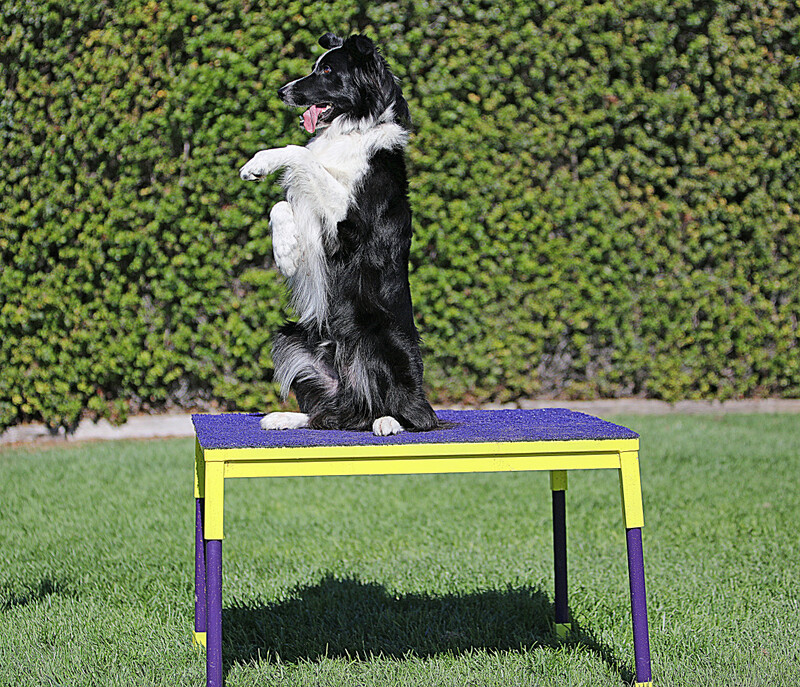 The most difficult jump for an ETS dog to distinguish is a jump that is placed 21 feet or greater from the previous jump and the dog has a straight approach to that jump, and the jump has multiple bars like a spread. Q: I was told by my trainer not to get ahead of my dog so much, does it help to run right next to a dog that jumps early? NJG: ETS dogs seem to struggle at times to find exactly where the jump bar is, so when the handler is a considerable distance forward of the jump, that gives the dog one more thing to consider in deciding where to take off for the jump. These dogs often do best when the handler does not run out too far ahead of the dog. This can be especially important when your dog jumps a spread. Q: Do some dogs recover from ETS? NJG: If your dog really has ETS they do not actually “recover”. Sometimes the dogs are only minimally affected, and for many years of competition the handler can manage the places on the course that the dog might take off too early. Over the years there have even been dogs with ETS on the AKC World Team, and many of those dogs and of course others compete at the highest level. Other dogs are affected more intensely and it is obvious that they are struggling too much to be jumped at regular completion heights. Q: My friends and trainer tell me my dog is injured and I should not compete with her. I have had her checked by every kind of expert there is and they say she is totally sound. I think she has ETS, what should I do? Leave your dog’s name, current age and age of onset of problem, eye test results if have have them and a link to a video of your dog jumping if you have it available. Q: I have never corrected my dog for dropped bars, and I train very positively with her. I have been told that I have created the problem of early jumping by training incorrectly. Is there something I could have done to make my dog jump like this? NJG: No, ETS is not “handler induced”. Almost all dogs can jump if they are sound, built reasonably well, and have normal vision. We can help or hinder our dogs’ who seem to have ETS, but in my opinion you cannot “give” your dog the symptoms of ETS, (taking off early). By correcting an ETS dog when they jump early or crash bars the problem can seem to get worse as the dog loses confidence, and the dog takes off even earlier to avoid touching the bar, which then leads to a circle of even worse jumping. 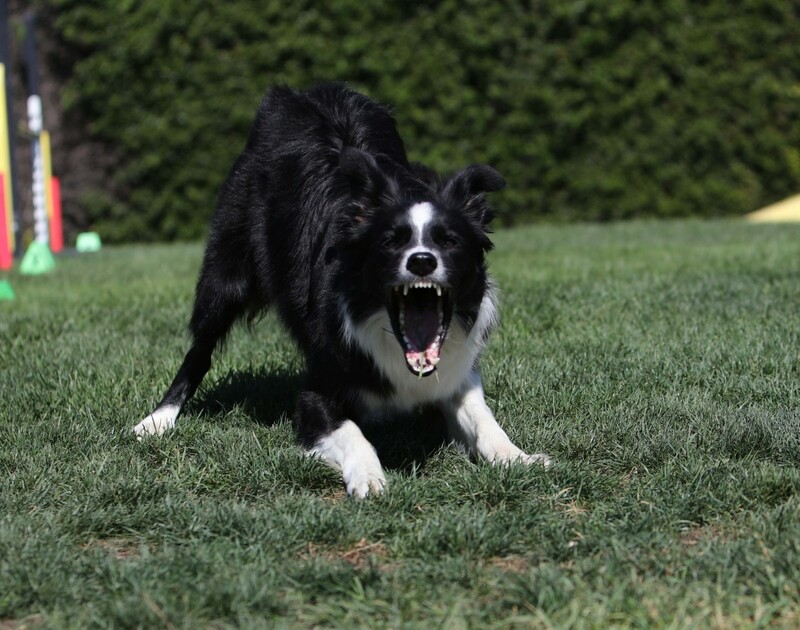 Q: What kind of jump drills could help my ETS dog? NJG: Some owners of ETS dogs have found that training on straight lines can acerbate the problem. They do well with confidence building on training arcs and circles. The way to keep an ETS dog happy is with building confidence and adding lots of reinforcements to the kinds of patterns your dog already jumps well. Video tape your dog so that you can watch them jumping in slow motion and possibly discover the areas that your dog seems uncomfortable. Repeated exposure to grids where your dog takes off early and appears uncomfortable may not be the right kind of training for your dog, especially if the bars are coming down. Build up your dogs’ confidence, use lots of rewards and absolutely no corrections. For some dogs even stopping to reset the bar points out an error to your dog and they may jump less confidently and henceforth, earlier, after you fix a downed bar. Q: What can I do to help further the studies on dogs that take off early? NJG: Your participation in open discussions about ETS may help your dogs as well as many others in the future. There is good reason to stay optimistic for many of our ETS dogs. Lots of dogs do not get progressively worse. We want to support handlers and dogs who are currently in this situation so that as many as possible can continue to participate in the sport they love in the most functional way possible. There is much to be learned by our dogs that show less severe signs. They ARE however related to the ones showing more extreme signs. We want to support the people who have ETS dogs and take advantage of the opportunity to learn from them. What makes them worse, what makes them better? We can learn from that. Those handlers who believe their dogs may have vision problems are seeing patterns in how they can help them cope better in the way they train and handle. We can learn more about what the problem may be by observing these handlers who are very aware of their dogs’ tendencies to take off early. We also can look at familial patterns, as ETS seems to be hereditary since some families of dogs produce more ETS dogs. While we hope a genetic study will be forthcoming, it may take a while for the DNA project to get started and for the studies to find the links. Thanks for remaining open minded and supportive of research about ETS. With your help we may discover the cause of this problem and hopefully the cure. 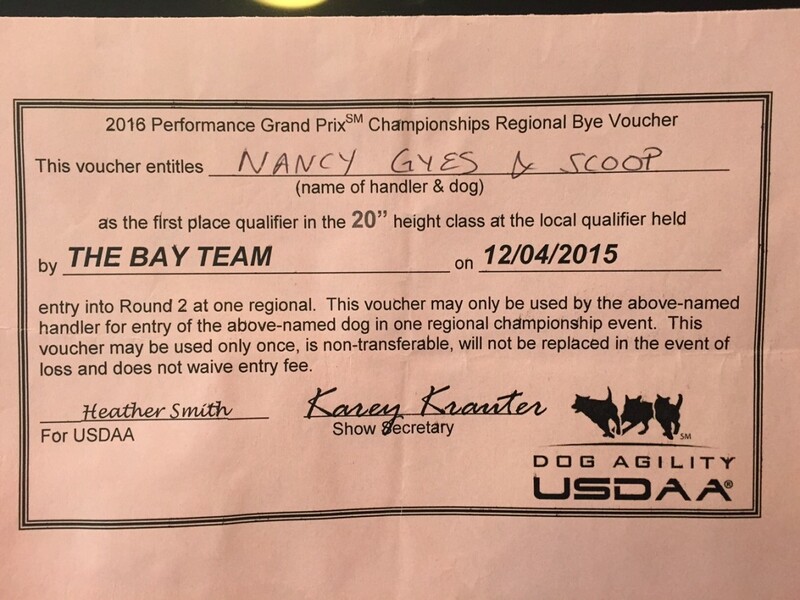 Before I write about a variety of border collies health issues on my mind I want to announce that Scoop has an OA now, and in a couple weeks we will compete in Excellent for the first time. I got in on one day of AKC competition Monday and we finished his 3rd leg in Open agility. We walked into the ring to try to get Scoops’s 3rd open JWW leg, but we walked out as fast as we went in after Scoop jumped the start line before I could get the release word out of my mouth. I think I was ready for it to happen as he has been pushy on his stays, sometimes moving a foot and I have had to go back to him often to do a restart. I led out onto the course, looked over my shoulder and started to raise my arm and off he came. I stayed in my spot and he realized his error and just stopped at my leg. He looked totally horrified as I guided him by the collar out of the ring. I hardly said a word but the look on his face as I snapped on his leash was well……PRICELESS! In standard his start was perfect and so we got to do our run and finish the title. Last night I ran Scoop in one of my classes and focused primarily on the start line. I lined him up, told him to stay, then ran to my leadout position, often 3 jumps out, then ran all the way back to him to get him a HUGE hunk of “lightly roasted wild beast”. Wow, did I have good stays all night. I need some weeks of this kind of reminder for him. He is getting faster and more driven to do this sport every day, I need to make sure my training keeps up with his desire to get out there and run. I reward my line ups, reward the stays, reward the recalls, and of course reward out there on the course while working. ROC on! Reward On Course, not just off. Besides thinking about training and competing I have been spending hours lately discussing and thinking about border collie health issues. 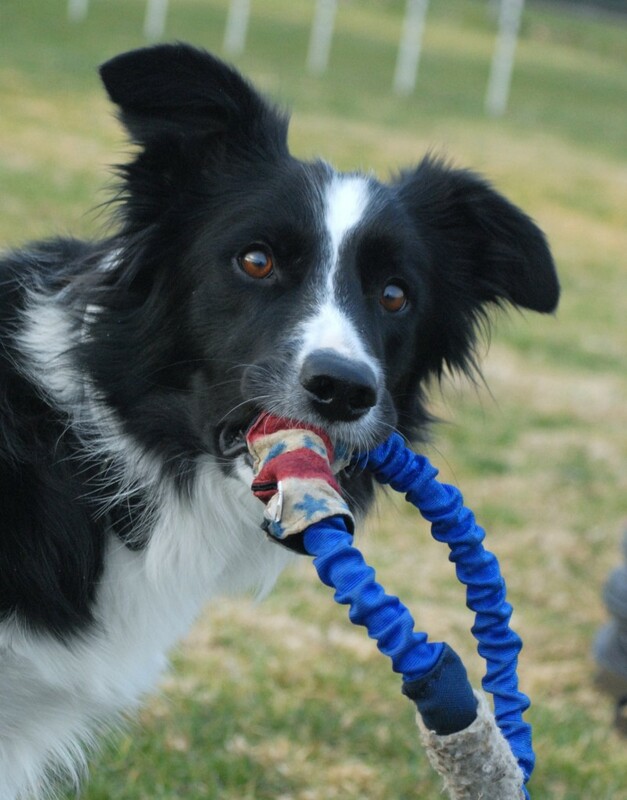 There is a new border collie study on late onset deafness. This is when a BC who has normal hearing begins to lose it around 2 to 3 years of age. Sadly the owners first think the dog is just being slightly disobedient or inattentive, then the realization hits that the dog’s hearing is impaired. These dogs may have tested for normal hearing as a pup. I was asked to help get border collie saliva samples for the control group of normal hearing dogs. Within a day of hearing about this study and volunteering to sample all my border collie students dogs, and send in the swabs, I was asked to participate in an ongoing study on epilepsy in border collies. The epilepsy study started a couple years ago but I believe got sidetracked waiting for funding. It is back in full swing and I am trying to help out by finding 20 border collies that have seizures to get blood or at least saliva samples from. I unfortunately have a border collie with seizures, my ten year old Panic, Silvertips High Anxiety. (What made me choose that name I will never know.) I have a short list of friends whose BC’s also have epilepsy. We cry on each others shoulders, and try not to think too deeply of the wonderful careers in agility that we are missing out on with our dogs. 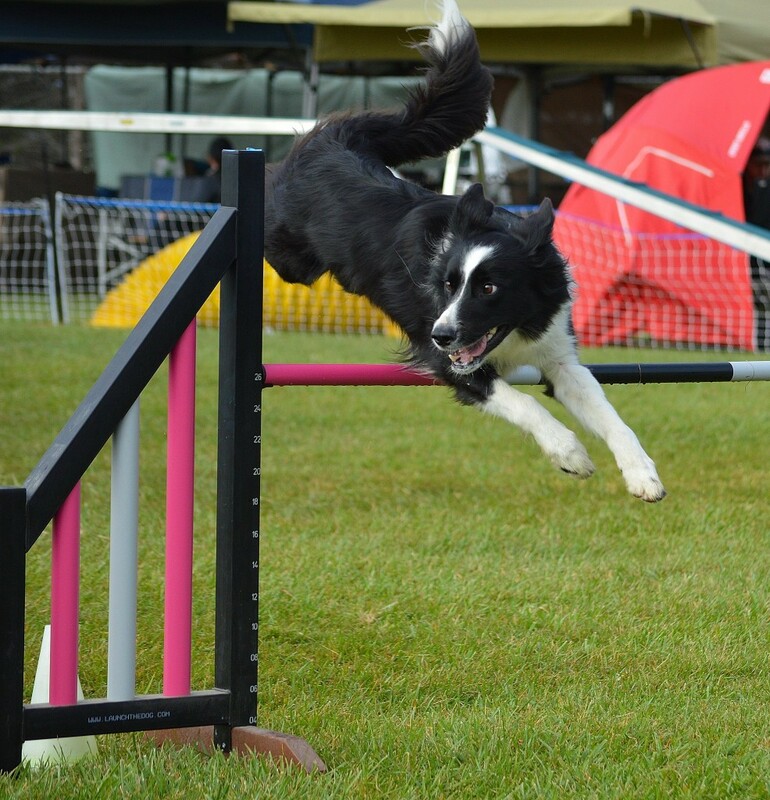 Panic started having seizures three years ago while doing agility. He has had 7 seizures total, 5 of them doing agility. After the last one I said never again. Panic gets to run into some tunnels once in a while, but I am afraid to do more than that. The terrible tragedy about Panic is that I have never had a dog love “doing” agility equipment more than Panic likes to do the stuff. All my dogs would be happy doing different dog sports, or just playing with me, swimming or doing tricks. Panic was a so- so obedience and tricks kind of dog, and he can’t swim. He likes, but does not live, for toy play like the rest of my dogs. I think he lived for agility. That brings tears to my eyes. Some of my friends’ dogs that have seizures are able to train and can sometimes return to competition. Geri Hernandez has a wonderful dog named Rake, Hob Nob Superior Attitude, that we always compare to Panic because of his jumping style as well as his enthusiasm for the sport. Rake does not have seizures during agility, he has them at rest, as do most dogs with epilepsy, and after 8 months without a seizure, Geri is able to do some training, and the hope is that he may be able to compete again. For both Geri and I though, we would be happy just to be able to train the sport the dogs love, competition is secondary. Please write to me if you have a border collie with epilepsy and wish to participate in this important study being funded by the ABCA. Epilepsy is a hereditary disease, meaning that if we can identify the gene we can identify the dogs who could pass it on to their pups. We could also test pups, and maybe eventually this horrendous disease can find its final end in our border collies and eventually all other dog breeds. This is the study that started at UC Davis with Dr. Mark Neff and is being continued by him at another facility. I will post more contact info here soon. For now, post a response to the blog or write me at powerpaws@aol.com for information on giving a blood sample for the study. When talking with the research assistant about the epilepsy study, she told me that as soon as they get moving on this study they are diving in with both feet into a study of dogs with Early Take Off Syndrome. Unless you have been living in a vacuum you have seen the tragedy of handlers trying to cope with this hereditary vision problem. Way too many of my students dogs are afflicted with ETS, and I have known many dogs over the years, with the problem. My first experience was with a couple students’ Belgian Tervurens about 15 years ago. We tried every kind of jump training with these dogs and could never teach the dogs to jump normally. We knew it was something to do with vision, but hadn’t a clue what it really was. Then I had my first border collie ETS experience. I rescued three 8 week old border collie pups from the pound and we kept one ourselves. Her name is Fly, and my husband Jim put a MAD title on her before we placed her with her current owner, Laura Manchester Derrett. Like all typical ETS dogs, the problems were not apparent in the beginning. We thought we could “fix” her funny jumping which actually did not look funny at all until she was about 2 years old. Her siblings had similar jumping issues. This was my first clue 10 years ago that this disease is hereditary and not ever fixable. Siblings with a similar jumping issue means that the dogs were born with the problem, there was nothing we did, and nothing we could do to fix the problem. Laura had a great but short career with Fly because her jumping deteriorated each year. She is an older retired dog now, living in England, and her vision problems have increased dramatically over the years. As do all ETS dogs. None of them ever get better. Some seem to jump better on certain surfaces, in certain light, or in different situations. Some only show the dramatic head dropping, stutter stepping when presented with a spread jump or tire, others “measure” slightly at each jump. We call it” measuring” when a dog slows a bit before jump and drops his head as if searching for the jump location. If you are not familiar with the symptom it can look like a dog is just struggling to get enough power underneath them before they jump. The dog may look injured but most of these dogs are found to be physically sound and no physical remedy can alter how they jump. I have seen some heavy bodied dogs who are asked to jump beyond than their comfort zone, and may have some physical limitations in their rear, seem to throw themselves over the jump in a way that looks like ETS. It may or may not be. When you watch carefully you see that these dogs though almost always take off for a jump earlier than they should, putting more of the jump distance before the jump, rather than jumping in an arc that puts the highest part of the jump right over the bar. Most handlers and lots of instructors do not notice these very subtle beginning signs of ETS. Many dogs are checked and found to have normal retinoscopies by Veterinarian Eye Doctors. There is no vision test for depth perception or lack of it. The perception problems can be minimal or extremely severe, usually starting at a couple years of age. The tragedy of this disease is the progression and for many dogs the total end of their careers. The dogs cannot actually see exactly where the jump bar is and this leads to them taking off very early and over jumping to compensate for their inability to really know where the jump is. When they guess wrong, they land on the jump. Every time they land on a bar, they lose more of their confidence to jump and so the condition deteriorates. I have a BC named Wicked that probably has ETS. She had a wonderful starting career. She won the 26 inch USDAA National Championships at 3 years old. She continued to compete until she was 11 years old, first at 26 then 22, then at 16 inch performance. It became obvious over the years that she just could not jump the higher jumps safely. Wicked took off early for spreads and tires. She rarely took down bars but she did totally crash into jumps at times when she could not judge the distances. Her jumping looked like she just did a little “pop up”. She had a sibling in England that totally measured all the jumps, and had devastating crashes. Another example of hereditary ETS. Wicked was only minimally affected by ETS, and I did not recognize it as such because she has a variety of other health issues that I blamed the problem on. She is 14 now, and her vision still continues to deteriorate, pretty normal for an older dog, but it is a lack of depth perception that we see, not just a general old age vision change. As I look back at her videos now I can see the subtle signs, the minimal head drop, the early jump on spreads, the “pop up” rather than nice running jump style on all the jumps. If you have a dog that takes off early it may or may not be ETS. Your dog could have a detectable vision problem, and believe it or not, some of these dogs can be fitted with contacts to help correct the difference in vision between the eyes. Dogs can have long or short vision just like people. If your dog has a disparity from one eye to the other, a contact could help. Any dog with a jumping problem should have their eyes checked. Recently a dog that was thought to have ETS was found to have a form of vitreol degeneration, a totally different kind of vision issue that of course complicated the dogs’ ability to see where the jump was and the result was taking off early. If you have a dog that takes off early, please write and let me know. I am going to be helping the researchers get blood or saliva samples of these dogs so that they can begin looking for the DNA marker that will help identify the hereditary nature of this disease. If we all are honest about our dogs’ health problems, we will all benefit from having healthier dogs with longer lives and careers. We put too much into our dogs and into our sport to hide our heads in the sand about these devastating diseases. We need to help all the great breeders of our wonderful pets to identify which dogs may have the disease, and so make good decisions about which dogs to use in their breeding programs. No breeder ever wants to make a pup that isn’t perfect. We can’t just blame breeders for these diseases. We need to get out there and protect our dogs by being informed buyers, readily discussing problems honestly and publicly without placing blame and also do our best to participate if possible in studies on the health issues that every one of us will deal with sooner or later if we stay involved in dog sports long enough. I hope you are lucky and have a dog who seems totally healthy like my Scoop, any day those issues can change though and I hope if you have a border collie and can help on the studies that you would be willing to do so.